General Session I Keynote Speaker. Michael Hsu is group president of North American Consumer Products for Kimberly-Clark Corporation, a $21 billion consumer products company whose well-known global brands are an indispensable part of life for people in more than 175 countries. A 20-year veteran of the consumer products industry, Mr. Hsu joined Kimberly-Clark in November 2012. Mr. Hsu oversees the company's approximately $7 billion dollar North American Personal Care and Family Care businesses, which is home to some of the world's most recognized and trusted consumer brands, including Huggies, Pull-Ups, Kotex, Depend, Kleenex, Cottonelle, and Scott. In this role, Mr. Hsu has direct responsibility for the company's marketing and sales in North America for disposable diapers, training and youth pants, baby wipes, facial tissue, bath tissue, paper towels and menstrual and incontinence products. In addition, the company’s Global Nonwovens operations and Sustainability, Safety and Continuous Improvement teams also report to Mr. Hsu. 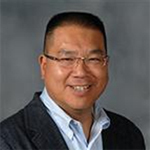 Prior to joining K-C, Mr. Hsu was executive vice president and chief commercial officer at Kraft Foods, where he spent four years holding positions of increasing responsibility and authority. Before Kraft, he spent six years at H.J. Heinz, holding the positions of vice president, marketing for Ore-Ida and Frozen Meals , and later as president for Foodservice. Mr. Hsu launched his career in the consumer products industry as a consultant with Booz Allen & Hamilton, where he spent a decade, rising to from associate to partner in Booz’s Consumer Practice. He led a wide range of high-impact engagements, with the majority of his clients being consumer products companies. A native of Silver Spring, Maryland, Mr. Hsu earned a bachelor’s degree from Carnegie-Mellon University and an MBA from the University of Chicago.